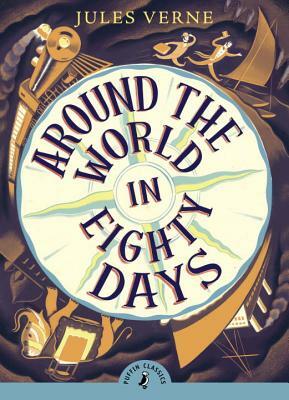 Shocking his stodgy colleagues at the exclusive Reform Club, enigmatic Englishman Phileas Fogg wagers his fortune, undertaking an extraordinary and daring enterprise: to circumnavigate the globe in eighty days. With his French valet Passepartout in tow, Verne’s hero traverses the far reaches of the earth, all the while tracked by the intrepid Detective Fix, a bounty hunter certain he is on the trail of a notorious bank robber. Set from the text of George M. Towle’s original 1873 translation, this Modern Library Paperback Classic of Verne’s adventure novel comes vividly alive, brilliantly reﬂecting on time, space, and one man’s struggle to reach beyond the bounds of both science and society. Bruce Sterling is the author of the nonﬁction books Tomorrow Now and The Hacker Crackdown, as well as the novels Distraction, Holy Fire, Heavy Weather, and Islands in the Net. With William Gibson he co-authored the acclaimed novel The Difference Engine. He lives with his wife and two daughters in Austin, Texas.